Also known as a herniated disk, it is a problem when a spinal disk’s gelatin-like center starts to develop problems when the gelatin-like center pushes outward and creates tears on the sturdy exterior. 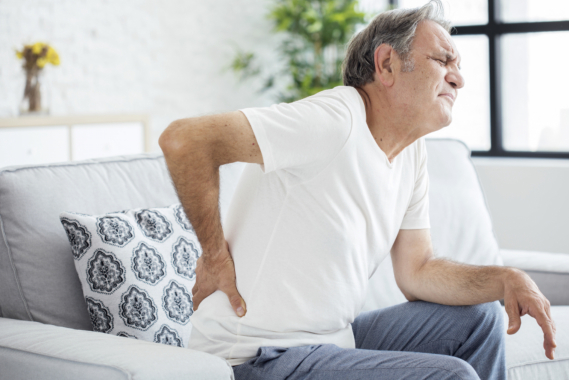 When a herniated disk occurs, neighboring nerves experience pressure and result in discomforts, numbing sensations, and even the weakening of extremities like an arm or a leg. For some people, the most positive thing that can come out of this condition is that they may not even need surgery to remedy this health problem and even experience little to no symptoms at all. Since most herniated disks take place in the lower back or the lumbar spine, it can also strike in your neck or cervical spine. For herniated disks in the lower back, most of the pain is concentrated in the buttocks, thighs or calves. For neck-related herniated disks, the pain is mostly felt in the shoulders and arms. The pain is even worsened when one coughs or sneezes or when the spine moves and the herniated disk is affected during the movement. There is a weakened muscle function in areas where its designated nerve is affected with the added pressure. This can cause problems with balance and problems in holding and/or lifting objects. Individuals may feel numbness in certain body parts where the affected nerves are located. With chronic pain treatment in Telangana, individuals who do not require surgery can learn how to manage the pain and how to properly move to avoid certain activities that will only aggravate the pain. A herniated disk often comes with age and it is often referred to as disk degeneration. Aging can make one inflexible and become more prone to spinal disk tearing since the water content inside these disks diminishes over time. Being overweight can put a lot of stress on your lower back. Handling so much physical stress can put the lower back to a greater risk of a herniated disk, especially when one does a lot of work lifting and strenuous physical back movement. When it runs in the family, individuals are susceptible to this condition. Avoid adding excess weight from unhealthy foods to avoid pressure on your spine. By learning how to pick up and carry objects properly, as well as other proper posture and back care, you can easily maintain a healthy spine. Whether a herniated disk runs in your family or not, exercising will strengthen your spine or torso muscles. Whether you require surgery or not, our pain management center in Hyderabad, Telangana can guide you with the right information about spine care and what you can do if you have a herniated disk. For your pain management options, contact Advanced Spine and Knee Hospital at 91-9100499070. This entry was posted in Lower back pain and tagged Cause of Herniated Disk, Disc Prolapse, Muscle Weakening. Bookmark the permalink.